Under both scenarios, the outcome for the worldwide polar bear population will very likely worsen over time through the end of the century. The modeling effort examined the prognosis for polar bear populations in the four ecoregions comprising their range using current sea ice projections from the Intergovernmental Panel on Climate Change for two greenhouse gas emission scenarios. Both scenarios examined how greenhouse gas emissions may affect polar bears: one looked at stabilization in climate warming by century's end because of reduced GHG emissions, and the other looked at unabated (unchanged) rates of GHG emissions, leading to increased warming by century's end. "Addressing sea ice loss will require global policy solutions to reduce greenhouse gas emissions and likely be years in the making," said Mike Runge, a USGS research ecologist. "Because carbon emissions accumulate over time, there will be a lag, likely on the order of several decades, between mitigation of emissions and meaningful stabilization of sea ice loss." Under the unabated emission scenario, polar bear populations in two of four ecoregions were projected to reach a greatly decreased state about 25 years sooner than under the stabilized scenario. Under the stabilized scenario, GHG emissions peak around 2040, decline through 2080, then decline through the end of the century. In this scenario, USGS projected that all ecoregion populations will greatly decrease except for the Archipelago Ecoregion, located in the high-latitude Canadian Arctic, where sea ice generally persists longer in the summer. These updated modeling outcomes reinforce earlier suggestions of the Archipelago's potential as an important refuge for ice-dependent species, including the polar bear. The models, updated from 2010, evaluated specific threats to polar bears such as sea ice loss, prey availability, hunting, and increased human activities, and incorporated new findings on regional variation in polar bear response to sea ice loss. "Substantial sea ice loss and expected declines in the availability of marine prey that polar bears eat are the most important specific reasons for the increasingly worse outlook for polar bear populations," said Todd Atwood, research biologist with the USGS, and lead author of the study. "We found that other environmental stressors such as trans-Arctic shipping, oil and gas exploration, disease and contaminants, sustainable harvest and defense of life takes, had only negligible effects on polar bear populations -- compared to the much larger effects of sea ice loss and associated declines in their ability to access prey." 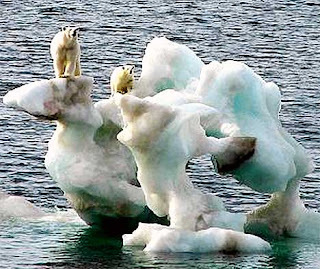 Additionally, USGS researchers noted that if the summer ice-free period lengthens beyond 4 months -- as forecasted to occur during the last half of this century in the unabated scenario -- the negative effects on polar bears will be more pronounced. Polar bears rely on ice as the platform for hunting their primary prey -- ice seals -- and when sea ice completely melts in summer, the bears must retreat to land where their access to seals is limited. Other research this year has shown that terrestrial foods available to polar bears during these land-bound months are unlikely to help polar bear populations adapt to sea ice loss. USGS scientists' research found that managing threats other than greenhouse gas emissions could slow the progression of polar bear populations to an increasingly worse status. The most optimistic prognosis for polar bears would require immediate and aggressive reductions of greenhouse gas emissions that would limit global warming to less than 2°C above preindustrial levels. The U.S. Fish and Wildlife Service listed the polar bear as threatened under the Endangered Species Act in 2008 due to the threat posed by sea ice loss. 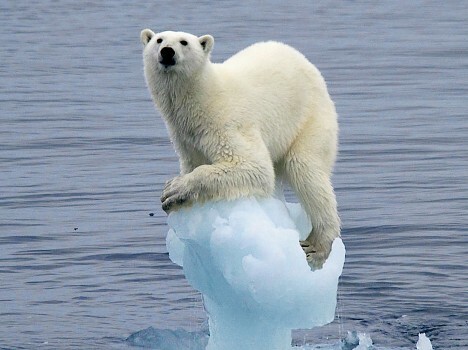 The polar bear was the first species to be listed because of climate change. A plan to address recovery of the polar bear will be released into the Federal Register by the USFWS for public review on July 2, 2015. The updated forecast for polar bears was developed by USGS as part of its Changing Arctic Ecosystems Initiative, together with collaborators from the U.S. Forest Service and Polar Bears International. This is so sad that the polar bears are badly affecting by this climate change. One of the reason of melting these cold region is human technology advancement. Due to which there are many natural calamities are taking place worldwide. Think about your logic here. If Polar bear are endangered, why is it OK to shoot so many per year? If you think shooting 700 bears per year in just one country is OK, it rather undermines your concern for the welfare of an animal you claim is endangered, especially when you say hunting is nowhere near as much of a problem as climate change when you freely admit there is no reliable data to support such a claim at present. I’m afraid it’s opinions like this which give climate science a bad name. Your views on climate change appear to be based on good science,I am puzzled as to why you are so blinkered on this issue. Bears may well be threatened in the longer term by the loss of Arctic ice, but the reality is that they are threatened here and now by shooting. Or is it OK to reduce the population because they are going to suffer under climate change regardless? I must confess, your logic on this one is very strange. If a species is endangered it’s OK to shoot them and reduce the population by many thousands, as long as we understand why they are endangered in the long run ? The only way out of such an impasse is to say, well they are not endangered at present, so it’s OK to shoot them. But does that not then impact on your original idea of bears starving and drowning with a fall in population due to climate change? You cannot have it both ways.Or are you saying the effects of climate change are bad, but lets shoot them anyway? Mullers claim about not a single bear having died from the effects of climate change is odd. How can he know that? We don’t know how every bear dies, so we don’t know whether that is correct or not. We just know that there is no direct evidence at present. It is a recurring theme that just because we know that there are long term negative effects from climate change, we tend to overlook the here and now dangers impacting our environment. ps, Neither of your links “disprove” anything, or make statements “blatantly false” What they do is draw strong correlations between a reduction in some populations and melting ice, which I think you will agree, is different. By the way, the links also contradict some of the points in your own posts. As CB stated on a separate thread, the polar bear population increased from ~5000 in 1964 to ~25,000 today, largely due to hunting restriction. The decrease prior to 1964 was due to unrestricted hunting. This has clearly been a much more significant influence on polar bear populations than the recent warming, especially since polar bear populations are currently stable (within measurement uncertainty). Unfortunately for CB, his claim that just because there is no evidence that climate change has had a negative impact means that climate change has not impacted polar bears. The problem is that human interactions have swamped any potential climatic effect. Neither Muller's claim of no polar bears dying due to global warming, nor other claims of polar bears dying due to global warming can be verified at present. That does not immediately falsify either of those arguments, as some have contended on this and other threads. Even the studies to which muon linked show no statistical difference in polar bear numbers in their studies. The only correlation was the decreased survival of sub-adult bears, although increased human contact could not be ruled out as a cause. In short, we do not know if the recent warming has affected the polar bears in a positive or negative way. Contact with man is known to have negative consequences. Etr#5: "we do not know if the recent warming has affected the polar bears in a positive or negative way. " No one has proposed any ways that warming benefits polar bears (wait until oil exploration is big time in the Arctic; that'll sure be good for 'em). The question is no effect or a growing negative one. It's looking like we'll be finding out very soon. Now you have to choose: Do nothing or do something. garethman, see my response to your comments in the other thread. You seem to have a rather inaccurate picture of the amount of hunting going on, what hunting levels polar bear scientists have estimated as sustainable, and the relative importance (i.e. 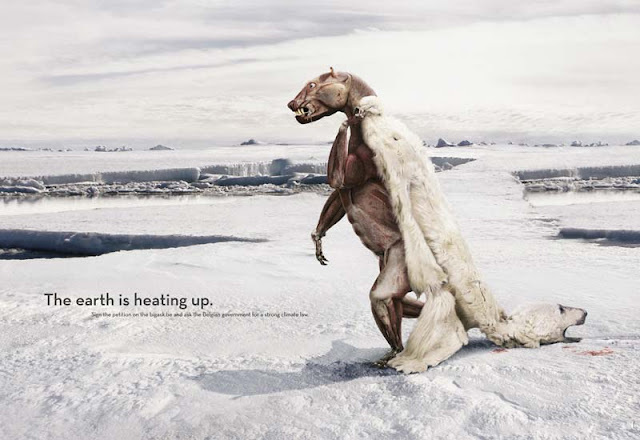 very little) hunting has compared to sea ice loss. "Mullers claim about not a single bear having died from the effects of climate change is odd. How can he know that?" Which was precisely my point. He can't. But beyond his lack of any basis for making the statement, logic also says it must be wrong. Polar bears that drowned in areas which were previously always covered by ice died due to climate change. The condition which led to their deaths (i.e. large areas of open water) did not exist before. Ergo, the thing which caused that condition caused their deaths. Otherwise, his argument comes down to the equivalent of, 'not a single polar bear has been killed by hunting' - you just have to ignore that the reason their heart, brain, or other vital organ stopped working (the DIRECT cause of death) was the bullet they were shot with (the INdirect cause of death) the same way you ignore the sea ice retreat. EtR wrote: "Unfortunately for CB, his claim that just because there is no evidence that climate change has had a negative impact means that climate change has not impacted polar bears." I can't make out what you are trying to say here... or even what you think I said. However, you go on to claim that polar bears dying due to global warming cannot be verified. THAT is not true. Just above I presented the very simple logic that polar bears cannot drown if they are not in the water... which also proves (global warming -> less sea ice -> more polar bear hours spent swimming -> more polar bears swimming when storms come up or beyond the limits of exhaustion -> more drowned polar bears) that global warming is killing bears. You have also been pointed at studies which extend this inescapable logic into the realm of observed reality. The study that you claim showed a 20% drop was based on computer models, not a counting of bear numbers. The capture and recapture (or mark and recapture) method of estimating populations always requires a model and is pretty standard practice in ecology. Actually counting polar bears over the vast area they inhabit is fraught with difficulty and will likely produce less reliable results.